It is a long way from missing your husband building boats in faraway Maine to mid-morning epiphanies in Cleveland’s Little Italy neighborhood. It is even farther from the subarctic snow banks of Fairbanks to transforming an empty Lakewood, Ohio, storefront into a new yoga studio, but that is the path Marcia Camino took in creating Pink Lotus. A Chicago native, the erstwhile on-the-road studio owner grew up in Texas, Indiana, New York, and finally Toledo, Ohio, where her steel-working family settled down. While attending Bowling Green University near her new hometown, she declared a major in English and the next year transferred to the University of Alaska in Fairbanks, where she earned a Master of Fine Arts. She told her parents she wanted to be a writer, a poet. “But, honey,” she remembers her mother saying. “Poets don’t make any money.” They work at naming the unnameable. Even when they get it exactly right it’s not exactly a high paying profession. After graduation she stayed in Alaska, writing, waiting tables, writing some more, and backpacking the state’s national parks. “It was very beautiful up there,” she said. But, despite the majestic geography and lofty scale she was far from home. She went back to the Lower 48. Back in Bowling Green she worked in modern dance and theater, met her future husband in 1992, and four years later moved to Cleveland. Planning their wedding in 1999 Mrs. Camino surveyed herself in her dress in the mirror. She practiced every day for six weeks and on the morning of her wedding successfully squeezed into her dress. Afterwards she rolled up her mat and put it away in a back closet. She resorted to dreaming about her husband, working long hours at work, enrolling in photography and film classes at night, ballet on weekends, shooting a 16 mm black-and-white movie in her spare time, and soon enough began to burn out. One May morning in front of her TV in their apartment in historic Little Italy she dusted off her yoga mat, unrolling it and starting to practice again. As she practiced what she still thought of as “all that yoga stuff’” in her living room she one day experienced a shift in perspective, physically and spiritually. Tears are messengers and sweat leads to change. Salt water can be the cure for everything. The first change Marcia made was to keep her mat in the open, out of the closet. “Unburden yourself so much that you can pass from moment, to moment, to moment,” says Amrit Desai, who designed the style of yoga Marcia Camino was practicing, a style described as more than a physical discipline, but a process of consciousness liberation, as well. One day on her mat led to every day on her mat, and eventually in 2004 to training at the Amrit Yoga Institute in Florida. She earned her 200-hour certification, going on to study with such nationally recognized master teachers as Paul Grilley, Rodney Yee, and Shakta Kaua Khalsa. The practice of Amrit Yoga, Marcia Camino’s home base as a teacher and student, is sometimes referred to as the posture of awareness. It consists of several breathing exercises, twenty-six classic yoga postures, meditation between poses, and deep relaxation. In 2005 she re-located to the west side of Cleveland, buying a house in suburban Lakewood with her husband Joe, who was back working on Lake Erie water craft, and began teaching yoga part-time at studios, colleges, and fitness centers. After five years of free-lance Have Mat Will Travel, eventually earning Yoga Alliance EYRT status as a teacher, she began to scour Lakewood for a studio of her own. “Deep down I was always spying for places, to create a space reflective of my personality, esthetics, and yoga philosophy,” said Marcia. When she found the space she wanted she made the leap and gave up the security of her 9-to-5 job at the university and signed a lease in the West End neighborhood of Lakewood. While many cities lack even one yoga studio, Lakewood sports two, with a third just across the bridge in Rocky River, as well as on-going classes at the YMCA and Harding Middle School. Marcia Camino’s new Pink Lotus was the fourth full-time studio in the area. Unlike studios that specialize in Vinyasa, a generally faster-paced workout, Pink Lotus tenders a wide range of the contemporary and traditional, including seldom-seen styles like Sivananda, which is what one of Pink Lotus’s students describes as yoga’s greatest hits. She cites a special love for Yin Yoga, created to benefit the body’s connective tissue and restore the range of movement lost to the conveniences and longer life of modern life. Live on the floor, she laughs about Yin Yoga’s poses. “We will be trying to bring to all we teach a sense of balance, happiness, and soul,” she said. 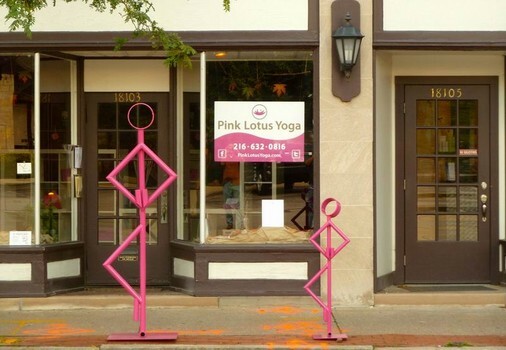 After months of planning, permits, and renovation, Pink Lotus opened in early December 2011. Like many another first-time business owner, Mrs. Camino had to overcome a series of obstacles, from raising necessary capital to finding the right plumber, babying her project day and night. The solution to burning the midnight oil turned up right next-door at the European-style artisan bakery on the corner. Man does not live by yoga alone. Bread is the staff of life. Sir Yeast a Lot to the rescue, because she must have bread! Blending the personal and professional, Marcia Camino’s Pink Lotus is both a calling and a business, feeding the body, mind, and spirit. It’s bread and butter, simple, nutritious. Cyclists with yoga mats slung over their shoulders park at the racks in front of the studio. The public art form bike racks were installed as part of Lakewood’s Bike Master Plan. The city’s mayor and West End councilman attended the unveiling.